Locations of selected field trip destinations to observe features associated with the Hayward Fault. Locations were chosen based on public access, and some locations discussed highlight regional geologic features, historic buildings, or infrastructure. General locations of field trip destinations, shown as green boxes, are projected on a satellite image (modified from USGS Quaternary earthquake fault data and imagery retrieved from Google Earth) (from figure 1). 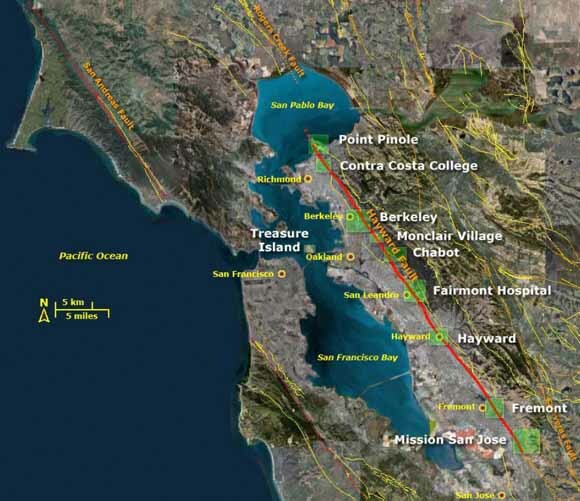 This report describes self-guided field trips to one of North America’s most dangerous earthquake faults—the Hayward Fault. Locations were chosen because of their easy access using mass transit and/or their significance relating to the natural and cultural history of the East Bay landscape. This field-trip guidebook was compiled to help commemorate the 140th anniversary of an estimated M 7.0 earthquake that occurred on the Hayward Fault at approximately 7:50 AM, October 21st, 1868. Although many reports and on-line resources have been compiled about the science and engineering associated with earthquakes on the Hayward Fault, this report has been prepared to serve as an outdoor guide to the fault for the interested public and for educators. The first chapter is a general overview of the geologic setting of the fault. This is followed by ten chapters of field trips to selected areas along the fault, or in the vicinity, where landscape, geologic, and man-made features that have relevance to understanding the nature of the fault and its earthquake history can be found. A glossary is provided to define and illustrate scientific term used throughout this guide. A “green” theme helps conserve resources and promotes use of public transportation, where possible. Although access to all locations described in this guide is possible by car, alternative suggestions are provided. To help conserve paper, this guidebook is available on-line only; however, select pages or chapters (field trips) within this guide can be printed separately to take along on an excursion. The discussions in this paper highlight transportation alternatives to visit selected field trip locations. In some cases, combinations, such as a ride on BART and a bus, can be used instead of automobile transportation. For other locales, bicycles can be an alternative means of transportation. Transportation descriptions on selected pages are intended to help guide fieldtrip planners or participants choose trip destinations based on transportation options, interests, or special needs.